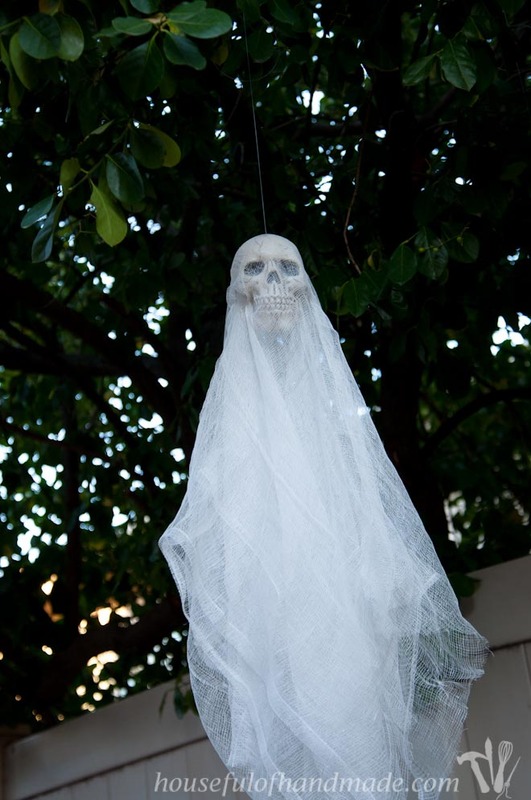 Now that the nights are cooler, and darker, it’s almost time to decorate the outside of our house for Halloween. 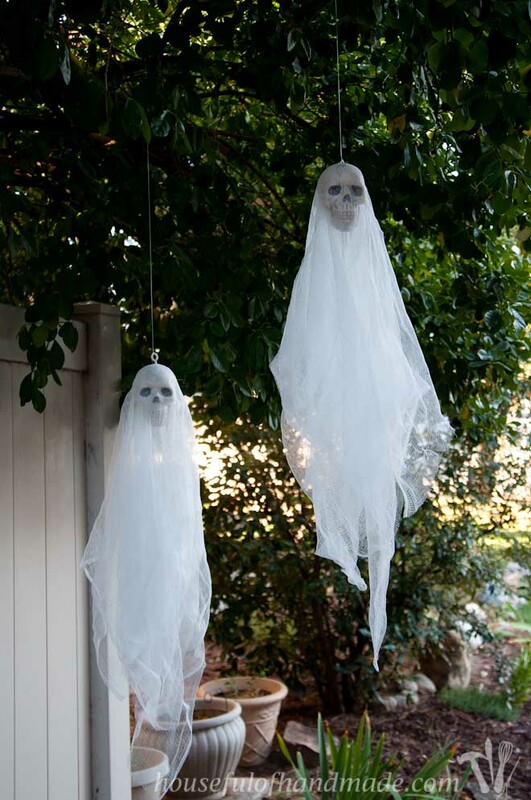 I have to wait until after this week because I need to cover the house with princesses and mermaids for my 4 year olds birthday party, but then I get to go all out and create the perfect spooky entrance to our Halloween house with these easy $3 skull ghosts. I am so excited, but I know I need to give my baby her time! The other day I had an hour to kill, so what better way to spend your time then to go to Target? Wandering the isles is the best form of therapy. I am even pretty good at not buying stuff 🙂 They had just filled the Halloween section so we spent our time getting excited for October! 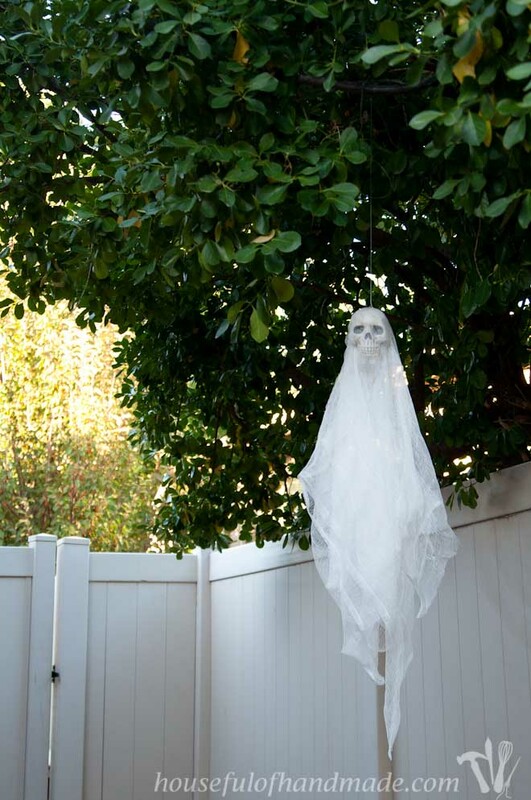 Then we came across some small plastic skulls for only $2, and I knew exactly what I wanted to do with it… make spooky skull ghosts to hang in the trees in our from yard. Yeah! The perfect decor to really make the entrance awesome. 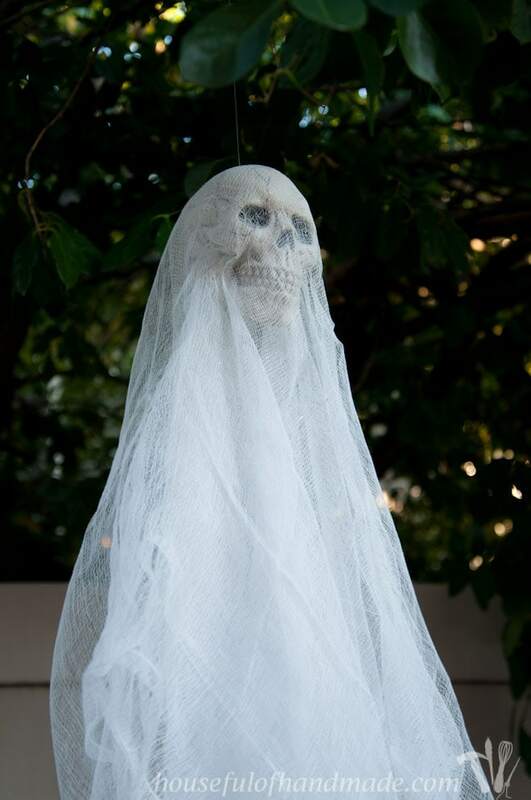 After a quick trip to Walmart to snag some cheese cloth for $0.50 a yard (I used 2 yards per ghost), I was ready to craft. I don’t know what is the best part of these ghosts, that they cost only $3 each or that they took about 10 minutes total to make? 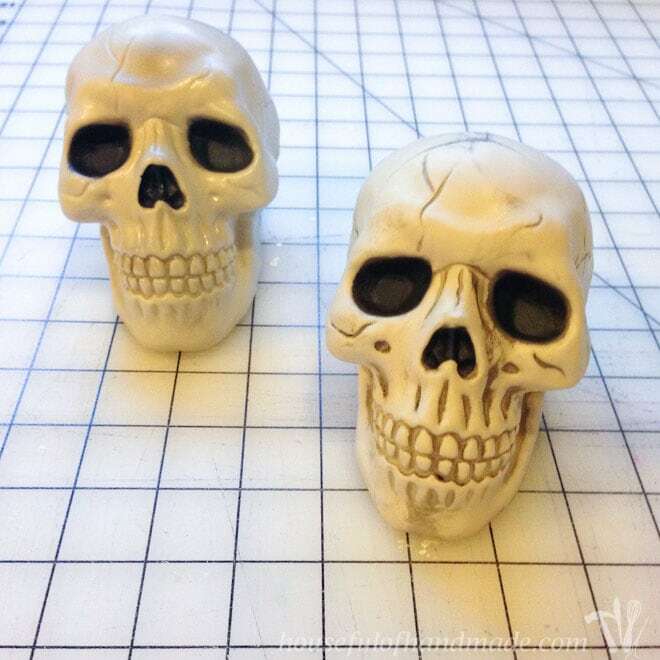 The skulls already had a hole in the top of them, but it was kinda big, so I drilled a new tiny hole just behind it and screwed an eyelet hook into it (or a hook that was squeezed closed because I only had one eyelet hook and didn’t want to make a trip to the store for something so simple). Then I cut 1 yard of cheesecloth. It was 36 inches wide so I ended up with a square. I centered the cheesecloth square over the hook. 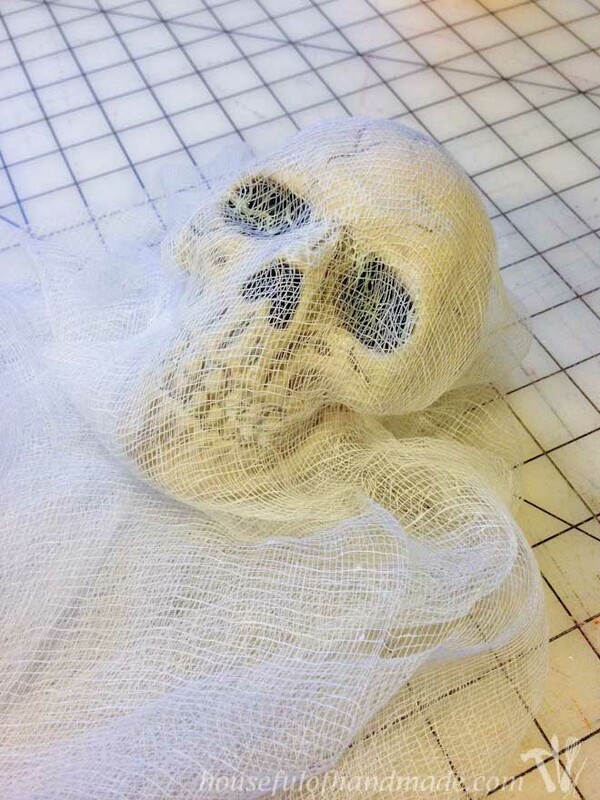 I wanted the cheesecloth to conform to the skull so I put some mod podge on the face of the skull and then used my hands to press the cheesecloth into the eye sockets and around the cheek bones. Then I added another layer of cheesecloth on top of that, making sure to conform it to the skull again. Then it was done, all I had to do was wait for them to dry before hanging them up with some fishing wire. 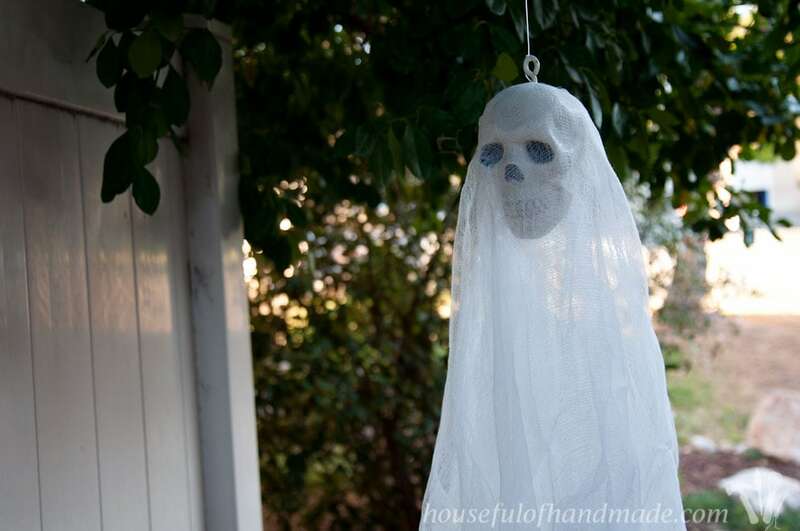 Now I am not going to lie, the mod podge probably won’t withstand the rain, but I am planning on hanging our skull ghosts up outside where they will most likely be protected, if not, the rain will help the cheesecloth to stick to the skull too. These are really spooky, hopefully not too spooky for my kids. They seem to be okay with the spooky stuff when they watch me make it. We just have to keep reminding them that they are pretend, we want them to be able to sleep in their own beds during October! Thanks Sarah! If we can make it through all of October without the kids getting too scared, it’ll be awesome. This is fun and cute! Kids will love it. I’m a huge Halloween nut and love thrifty holiday decor. This hits the mark for me. Inexpensive and easy! Pinning! A woman after my own heart 🙂 I love thrifty decor too, especially seasonal decor that will only be used for a short period of time. My daughter wants to have a holloween party so I need all the inspiration I can get. This is perfect. Thanks for sharing. 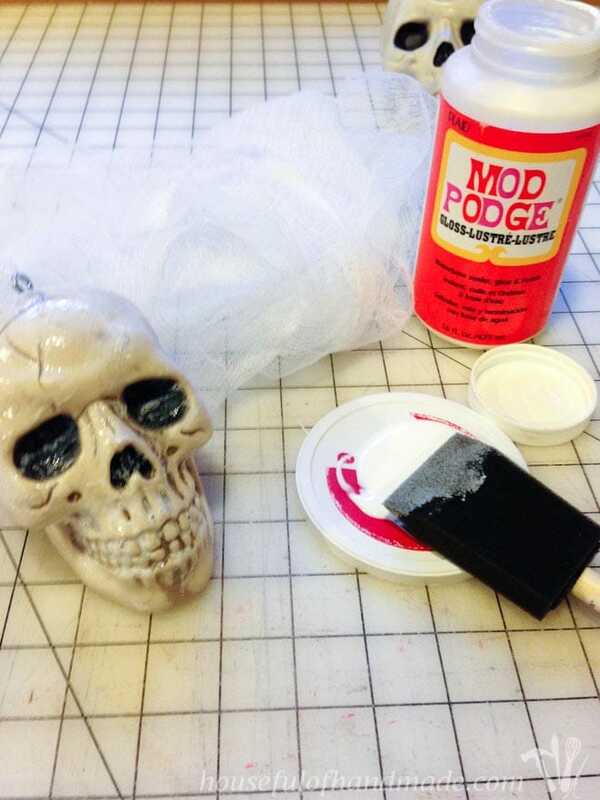 I love quick and inexpensive Halloween crafts! I am going to have to look for those skulls the next time I am at Target. I wonder how it would work to paint them with some glow in the dark paint before covering them in cheesecloth. Oh, glow in the dark paint would look super awesome. 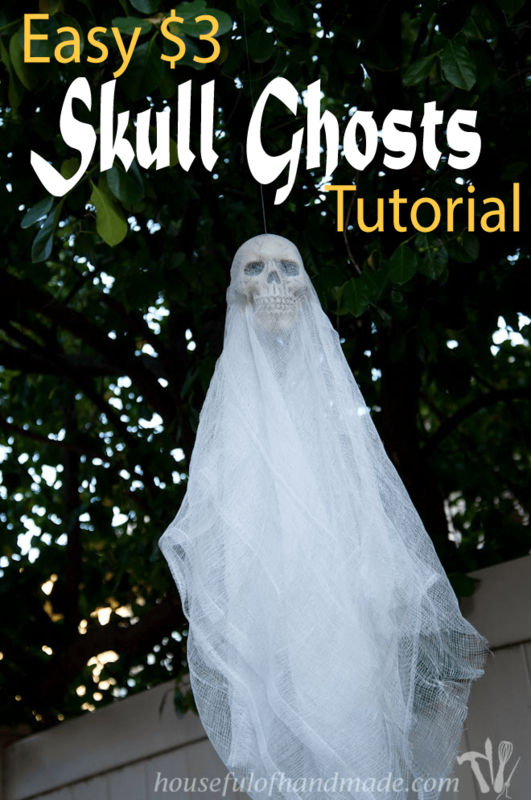 And if it’s a spray paint, you could spray it on the cheese cloth a little bit too to make glowing floating ghosts!